Lake Tuggeranong College team ‘Steve the Happy Rock’ – which included students Timothy Herrmann, Saksit Wilamat, Jayden Ahadizad, Jeremy Green (Richard Fowler not in photo) - finished second at the CyberTaipan national cyber security for secondary schools competition. Canberra students regularly demonstrate that they are on the cutting edge when it comes to technology. Well-versed in the educational power of smartphones and laptops, students today learn firsthand about the transformative power of technology in our modern world. But did you know how good they are when it comes to cyber security? Last week, three ACT public schools were able to prove this as top 10 finalists in the national CyberTaipan competition. 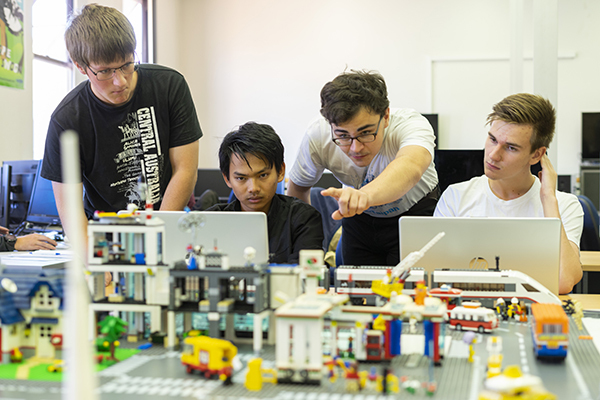 CyberTaipan is an Australia-wide cyber security competition open to anyone between 12-18 years of age with an interest in cyber, defence, puzzles and code breaking. Modelled on the USA’s ‘CyberPatriot’ program, versions of the competition have been running internationally for more than a decade. On Saturday 16 March, Lake Tuggeranong College, Melba Copland Secondary School and UC Senior Secondary College Lake Ginninderra were recognised at the competition’s final event. Lake Tuggeranong College took home second place. The Lake Tuggeranong College team had four hours to identify cyber security vulnerabilities in a set of virtual images that represented operating systems. They were scored on their ability to harden the systems while maintaining critical services. The team received a trophy, as well as individual prizes including vouchers for further cyber security training. Lake Tuggeranong College’s team coach, teacher Graham Cassells, said it was a great result for the school and the students. “Lake Tuggeranong has a great existing link with the Department of Human Services, who we do work experience with in cyber skills development,” Mr Cassells said. Congratulations to all the students who competed at the CyberTaipan event!